When Natalia Indrimi talks about “cultural translation” she means it in the broadest sense imaginable. The Centro Primo Levi, of which she is executive director and one of the founders, is now in its 10th year of finding new ways to awaken the world outside Italy to the Jewish world within Italy. But its most recent initiative, J-Italy (www.j-italy.org), aims at nothing less than bringing as much of the approximately 2,173-year-old culture of the Italian Jews as possible to the widest possible audience in ways that, as Indrimi stresses, bring it to life. Which literally happened when CPL invited several American writers on a whirlwind tour of the first two regions to receive in-depth coverage—Marche and Apulia, in Southeastern Italy. In Ancona, for instance, there never would have been the wildly successful annual klezmer festival that began in 1996 and, in 2007, widened its scope considerably to become the International Adriatic Mediterranean Festival, featuring performers not only from the Middle East but from North Africa, the Balkans, Turkey and Italy; or one of the most original community archives, a tombstone timeline that we visited early the next morning. 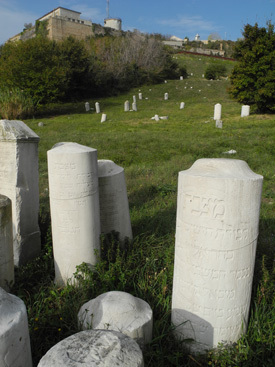 After a stroll through a park fragrant with wild mint, we stood overlooking Ancona’s Campo degli Ebrei, one of Europe’s oldest Jewish cemeteries, dating from 1428. After a monumental restoration effort funded by the city and led by architect Giovanna Salmoni, a member of the Jewish community, it—like the synagogue—became part of the municipal museum system. Garibaldi during the Risorgimento. He was born in Pesaro, about an hour up the coast from Ancona. The synagogue in Pesaro overlooks a street named for another famous Jewish native, Sara Levi Nathan, who was a great friend of Garibaldi’s and the mother of Ernesto Nathan, mayor of Rome from 1907 to 1913. Today, no Jews live in Pesaro. The two young women who welcomed us to the synagogue work for the city, which restored it and keeps it open to visitors—as many as 100 on Sundays. Light flooded the second-floor sanctuary, playing up its bare bones splendor, deepening the chiaroscuro of the oak-leaf medallions encrusting the ceiling. The oak—la guercia—was the symbol of the Della Rovere dukes, who ruled this part of Italy before the papacy annexed it and forced the Jews into ghettos. On the way back to Ancona we stopped in another coastal town, Senigallia, for a lavish kosher dinner (spaghetti with fresh sardines and Marche’s legendary Rosso Piceno wine) at the elegant Arca di Noe inn, owned by Riccardo and Simonetta Morpurgo (www.arcadinoecountryhouse.com). We also visited the synagogue, where I marveled at the three stately tzedaka boxes embedded in the foyer wall, particularly handsome specimens of the built-in boxes every Italian synagogue seems to have, tzedaka being part of the fabric of every Jewish community no matter how small or poor. On the boards were names of families who worshiped here for generations followed by columns headed by numbers with corresponding little holes. Below the holes were spaces for wooden pegs indicating the amounts of pledges on Shabbat, when writing is forbidden. People with those names don’t live here any longer, Zuares said sadly. But newcomers have given new life to Judaism here and elsewhere in Italy. Zuares and his family, for example, were among thousands of Libyan Jews who arrived in 1967, fleeing the fallout of the Six-Day War. Zuares proudly showed off the Torahs, one of which wore a silk parokhet woven in the Pesaro Rose design popularized by local ceramicists in the 18th century—a classic example of how Jews in Italy’s ghettos put their own spin on the motifs and customs of the larger communities. I remembered seeing a photo of this pattern in the guidebook Marche Jewish Itineraries: Places, History and Art by Maria Luisa Moscati. In a back room of Urbino’s synagogue, built in 1633 and restored in the 1970s, we saw masterpieces that conjured more benign images: piles of magnificent Ark and Torah covers, halla and Shabbat cloths embellished with richly embroidered pomegranates, grapes, lions, birds and, of course, the Pesaro Rose—all the handiwork of the women of the ghetto. This was the only art they were allowed to create, and art it certainly is. From Urbino we flew to the southernmost part of Apulia, the heel of the Italian boot, known for those hive-like stone farm dwellings called trulli, and for burrata cheese, a current craze in foodie circles, not to mention for Primitivo wine, orecchiete pasta and some of the world’s tastiest olive oil. 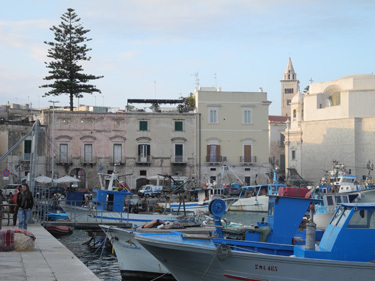 But Apulia is also an up-and-coming Jewish destination. In 2001, the University of Salento began a Jewish studies program, headed by the ebullient and downright Indiana Jones-like Fabrizio Lelli, who took us on an incredible journey through a part of Italy where Jewish sites from communities that flourished from the first millennium until the expulsions and conversions of the 1500s are being rediscovered and Judaism reborn. We started in the resort town of Santa Maria al Bagno where, at the end of World War II, the Allies requisitioned palatial seaside villas to house refugees en route to Israel and America. Each black-and-white photo on display in the two-year-old Museum of Memory and Welcome tells a moving story, and one of them—of two boys and a bicycle—sprang to life when Lelli introduced us to the older boy, Vittorio Perrone, who is now 84. He grew up here and was 18 when he met Jacob Erlich, a 15-year-old refugee from Sarajevo, and lent him his treasured bicycle. They lost touch after Erlich immigrated to Argentina. But, in 2001, Erlich, who now lives in Miami, came back to Santa Maria and they renewed their friendship. There were several other transit camps in Apulia, and collecting and compiling the biographies of East and Central Europeans who began new lives here is a central part of Lelli’s work (find out more at www.profugiebreinpuglia.it). But he is equally passionate about his research into the region’s medieval Jewish heritage and its present-day Jewish revival, both of which we discovered the following day in Trani. At lunch overlooking the ancient harbor, Francesco Lotoro, a distinguished pianist and musicologist who has collected and recorded 4,000 compositions written by prisoners in concentration and detention camps from 1933 to 1945 (www.musicaconcentrationaria.org), told us about his struggle to convert to Judaism—”It’s a long process in Italy”—and then to pull off the conversion of a medieval synagogue-turned-church back into a synagogue where he and other Apulian converts, most claiming Converso heritage, could worship. “Of course there were some halakhic problems,” he said. For one thing, there was the Byzantine Madonna and Child fresco in the Ark: Both church officials and Jews agreed it should remain—but under wraps (a false wall covered with a menora-embellished cloth). Then there was the bell tower. “One night we climbed up and built a great Magen David on top of it,” Lotoro said. So now the Scola Nova Synagogue is again open for prayers and learning; it just might be the oldest functioning synagogue in Europe. Not far away is Sinagoga Museo St. Anna, another medieval synagogue-turned-church-turned museum of local Jewish history run by the Catholic diocese.